Ski patrollers always look at fall as a time to get back into the swing of things ahead of the first runs of the season. Perhaps then, it’s not surprising that patrollers aren’t the only ones who need to get in some preseason training. 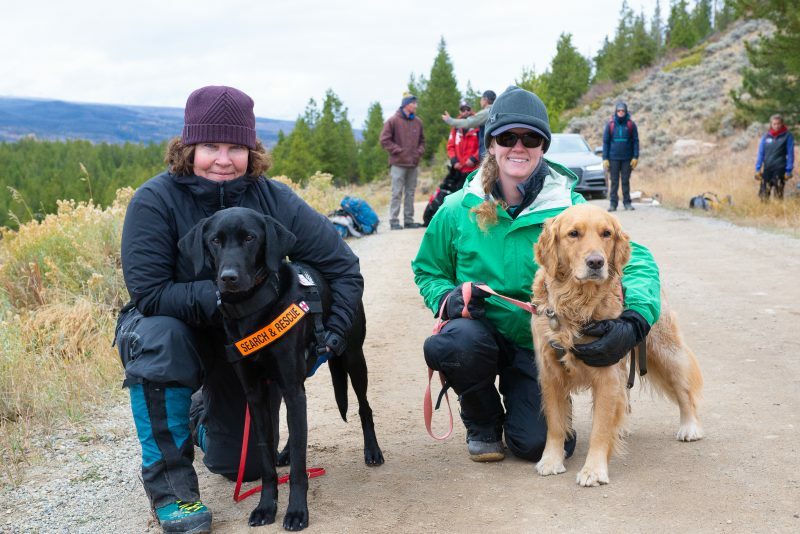 Over four days during the second week of October, Colorado Rapid Avalanche Deployment (C-RAD) hosted dog teams from across the state for training at Windy Point Campground in Dillon, Colorado. 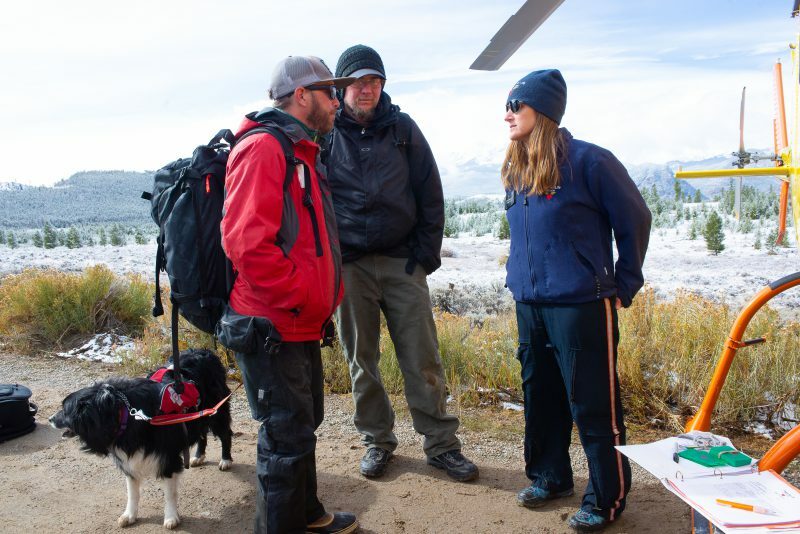 The training included getting Deployment Training Cards punched with Flight For Life® Colorado, a program that enables a team that consists of a handler, an avalanche rescue dog, and a snow safety tech to fly with Flight For Life® Colorado to the scene of an avalanche in the backcountry. 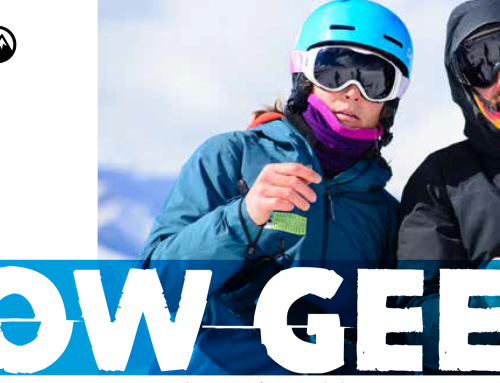 These cards are different than the standard Lift Ticket that Flight For Life® offers to search and rescue teams, as with those cards a flight paramedic or nurse is still flying with the SAR responder. The C-RAD Deployment Training Cards allow the C-RAD team to fly on their own with just the pilot. 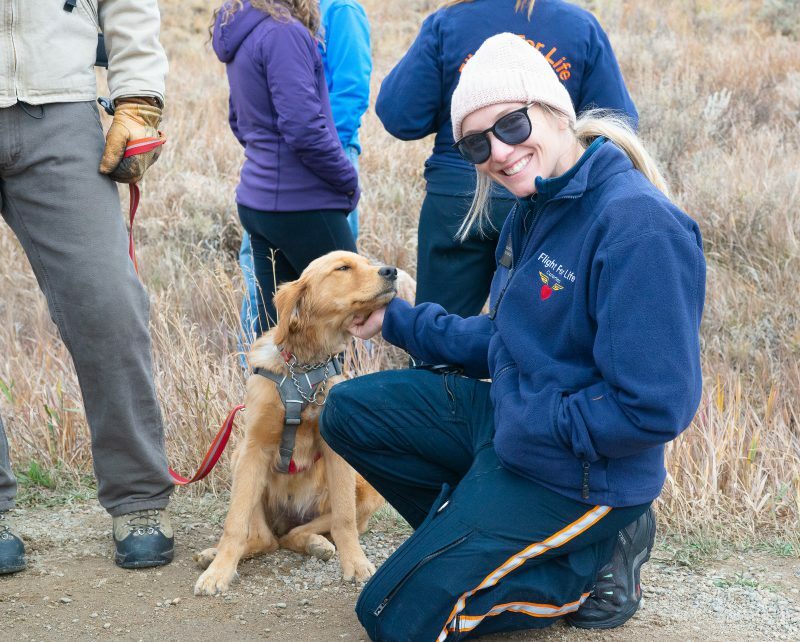 In Colorado, avalanche rescue dogs started to be trained in Summit County in the mid-‘80s. Summit is home to four Colorado ski resorts: Arapahoe Basin, Breckenridge, Copper Mountain, and Keystone. It was an avalanche on Peak 7 in Breckenridge in 1987, which was then out-of-bounds territory, that sparked the idea of creating a program to rapidly respond to backcountry accidents. In that slide, eight people were caught, and four people were killed. Several dog teams were called in to try to help with the body recovery. 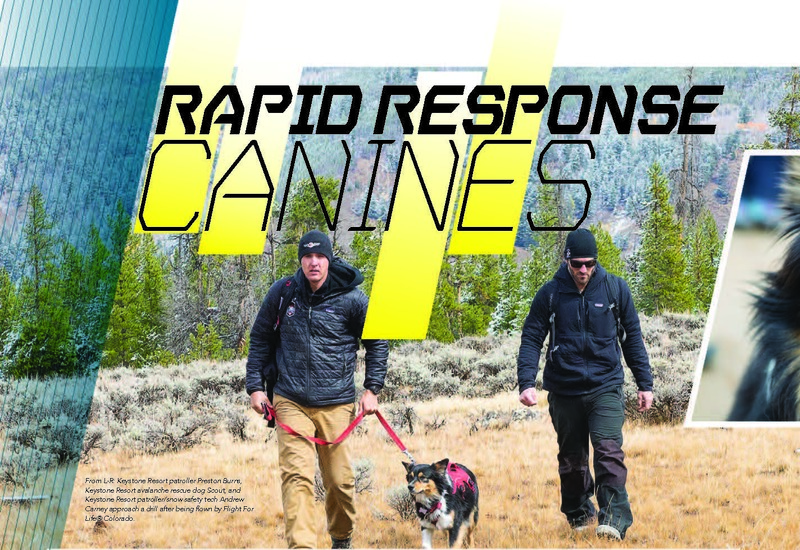 “During that time, some of the people involved and other folks that were around the county started to have conversations about, ‘Hey we should look at pairing and partnering with Flight For Life® and with rescue resources and coming up with a program where we can deploy avalanche dogs with the helicopter,” says C-RAD president Doug Lesch, who patrols at Copper Mountain and is also a dog handler. “Once the Lifeguard Two helicopter was up here at Summit Medical Center in the early ‘90s, that was when the relationship with Flight For Life® really took off. John Reller, an Arapahoe Basin patroller and dog handler, was one of the people who helped get the program off the ground back in the ‘90s and says that it was a relatively easy sell. “There was no problem convincing anybody,” states Reller. 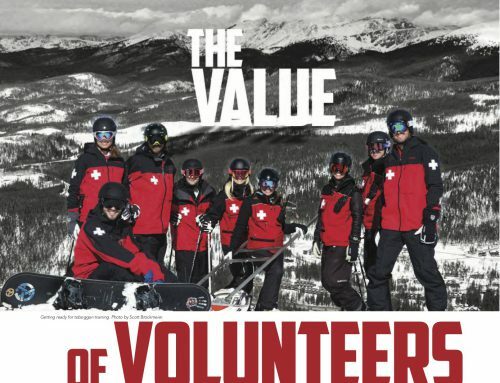 “In late 1990, early 1991, ski patrol, search and rescue, the sheriff’s department, and Flight For Life® all started having conversations, realizing that each of those groups had some really specialized skills and that if we combined those specialized skills, that could really save a life in an avalanche situation. 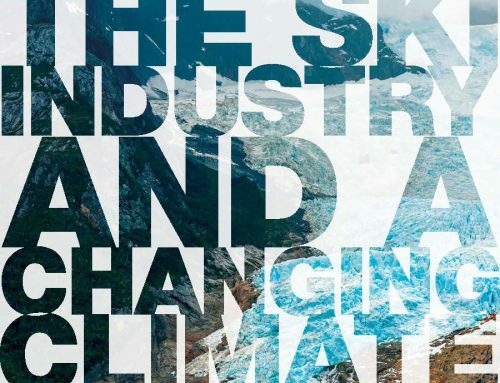 C-RAD currently has grown to over 70 members, with many Colorado ski resorts represented. C-RAD hosts two training events each year, one in the fall and one during the winter. 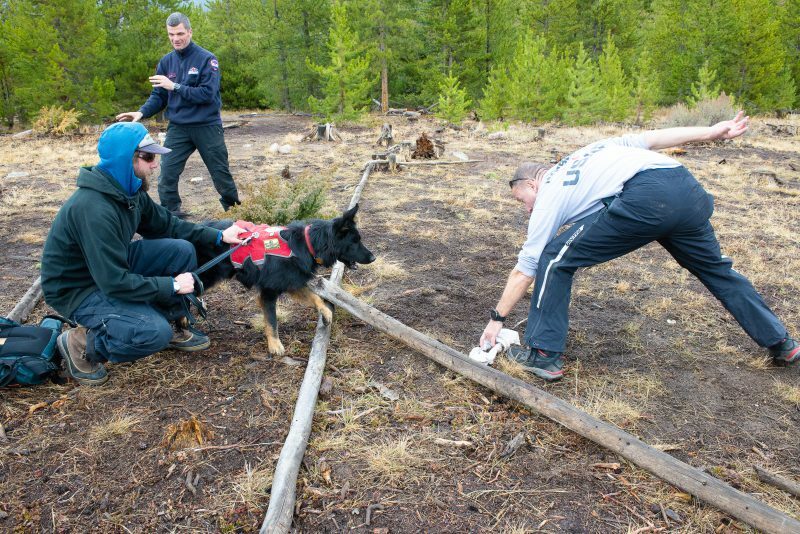 They often bring trainers in from out of state to work on drills for the dogs and will run mock scenarios where a dog, handler, and tech get flown to the site of an avalanche. In the winter, the area hosting C-RAD will actually bury people in holes in the snow for the dogs to find. 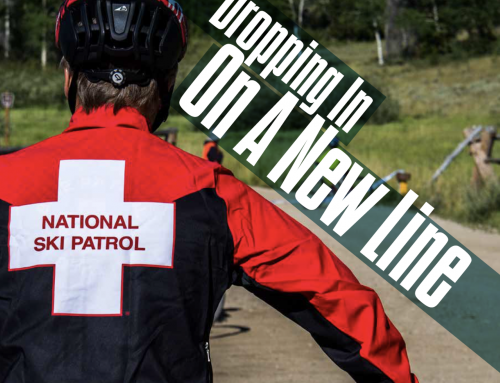 The fall event is a very popular one for the patrollers in the program, and something they find both enjoyable and valuable for the training. During the training, the handlers got training drills in with other dogs who they might not see or work with too often. This is one aspect of the C-RAD fall training that the handlers find invaluable. The openness in the training is the other aspect the handlers find very valuable, as it allows them to work on a variety of training strategies. On the second day of the training, there was a light dusting of snow on the ground. Early in the morning, a Flight For Life® helicopter flew in and landed on the dirt road that leads to the campsite. Once the rotors stopped spinning, the crew debarked and gave a presentation on all the aspects of the helicopter and how the handler, dog, and tech are to approach and load the helicopter. 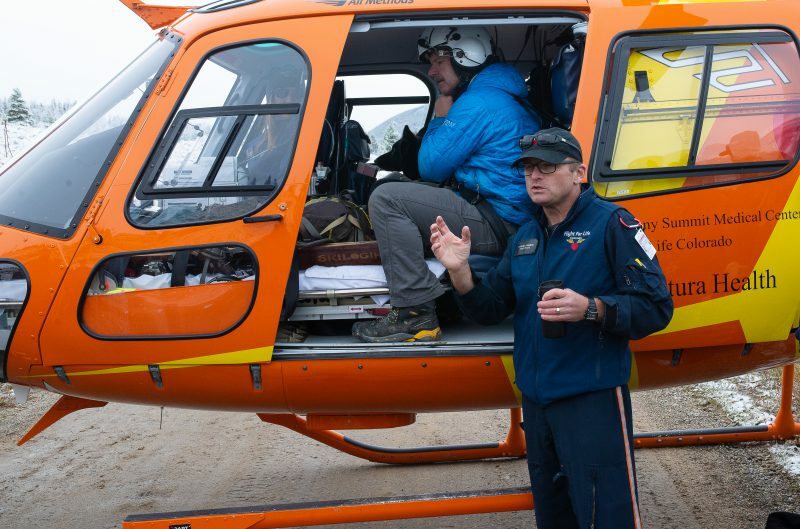 On the crew that day was Flight Paramedic Tim Baldwin, who is also a patroller at Steamboat Resort. Baldwin has been with Flight For Life® for four years. To be validated as a C-RAD responder, the dog and handler go through a stringent testing process. The actual deployment via Flight For Life® is under the auspices of the sheriff. C-RAD itself is a certification standard, and it is up to the sheriff in charge of search and rescue in a particular county whether they want to use C-RAD as the standard, or something different. For C-RAD certification, the testing site is 100 meters by 100 meters, and must be at a different area than the dog and handler normally train at. The site can have up to three live “victims,” so to prepare the site they dig snow caves to bury the victims in. There can also be three scent articles. The goal is for the dog and handler to clear the site in 20 minutes, including an interview to discuss how the test went. Each live find has to be confirmed by a probe strike, and the hosting area will provide people to dig at the probe to confirm. “There’s four categories for the handler and five categories for the dog; each category is scored one through five, and that score has to average out to a certain number,” explains Lesch of the test. “There are critical fails, like not finding lives. The handler decides when to call it, so they make the decision to say, ‘I feel like based on where I’ve been and what my dog has found and the number of people here that the site is clear.’ At that point, the examiners will interview the handler to get them thinking about the bigger picture. OK, so the search and rescue team has showed up or the sheriff is calling and they’ve got another dog team inbounds; where is your highest probability, the next area you’d like to focus a team? 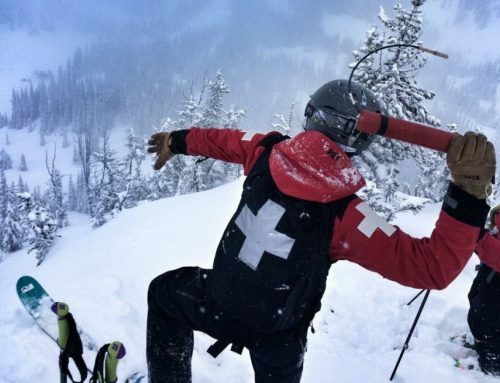 While there has never been a live find in North America, several C-RAD responders have been deployed and found avalanche victims. In January 2016, there was a slide on St. Mary’s Glacier, and the search was delayed due to weather. The searchers had been looking in one area, but Reller and his dog, Recco, found the missing person in a different location. Reller is very experienced as a handler; Recco is his fourth avalanche search dog, and he currently has a fifth. The actual helicopter deployment is a process. Upon landing, the flight nurse and flight paramedic will approach the team and check their Deployment Training Cards to make sure the team is current. 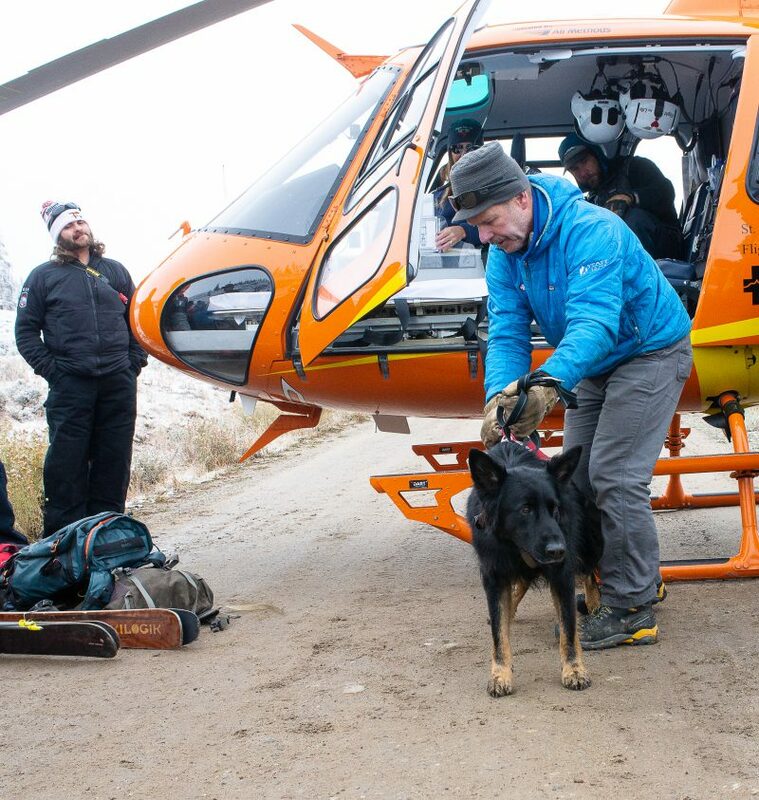 At that point, the handler will hand the dog’s leash to the tech, take both pairs of skis, and approach the helicopter, dropping the skis on the ground near the left skid. The handler will step into the helicopter and sit in the back right seat. Once secure, the tech will approach with the dog and lift the dog into the helicopter and give it to the handler, who will put the dog on a leash and sit it on the ground to his or her right. Then the tech will load the skis on the helicopter’s patient pram, step into the helicopter, secure themselves, and close the door, at which point the pilot is in charge. The speed of the deployment is what is most valuable. 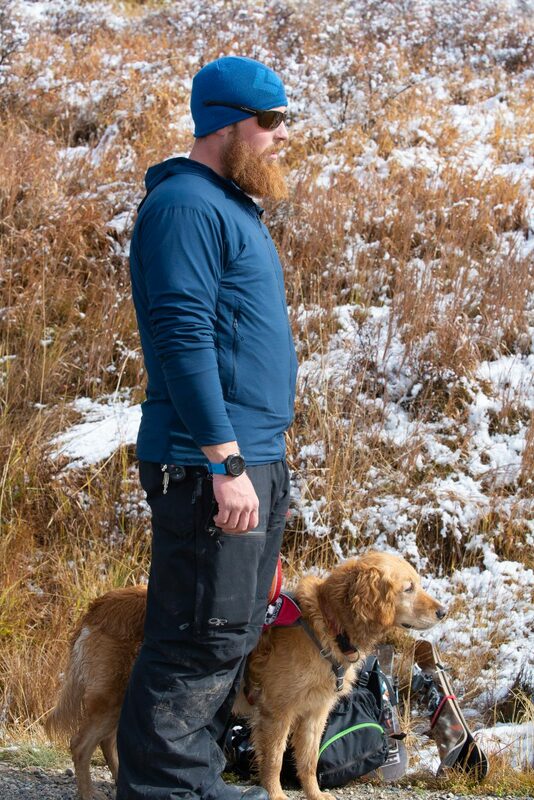 In spring 2018, Arapahoe Basin patroller Greg Dumas, his dog Sasha, and Hiller as snow safety tech were deployed to an incident on Georgia Pass, Colorado, that resulted in the death of a snowmobiler. The victim was located and dug out by Sasha. 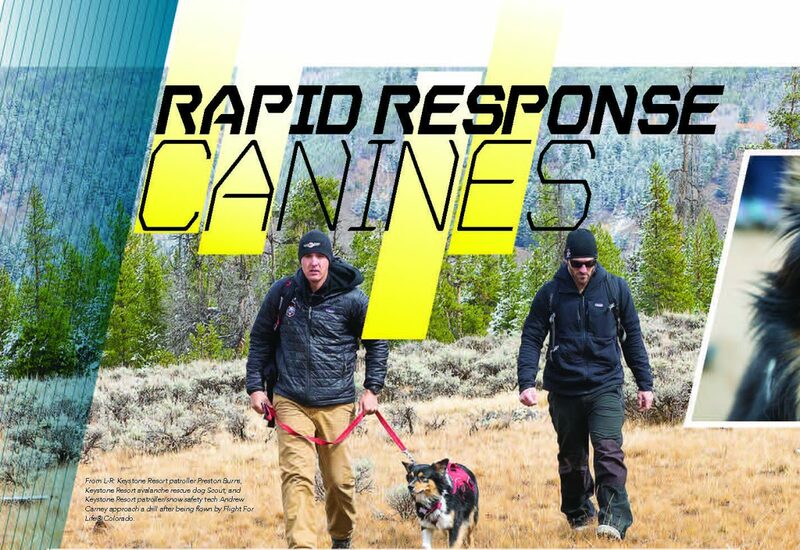 Dumas and Sasha were recipients of the Subaru-National Ski Patrol scholarship to the 2017 Wasatch Backcountry Rescue International Dog School, which NSP and Subaru are again supporting in 2019 (see “Wasatch Backcountry Rescue International Dog School,” page 64). While the closure that C-RAD teams can bring to families is very important, ultimately what they always hope for is the live find. If you are interested in learning more about C-RAD, or in supporting their mission, you can visit their website and their store, where they sell collectible T-shirts. Every purchase goes toward training dogs and teams and benefits the community. Visit their site at https://c-rad.org/.